Miami-Dade is an international hotspot. About 55 percent of the county’s population is foreign-born and it was foreign investors who reenergized Miami’s real estate market following the fall of Lehman Brothers and the ensuing financial crisis. Yet despite the area’s global appeal, most developers have been content until recently with retaining local architects to design their buildings. An increasing number of private developers are looking all over the world for architectural superstars to design their products. Rodolphe el-Khoury, dean of the University of Miami School of Architecture, said local developers are casting a “wide net” for acclaimed architects. The hunt is also a “recent phenomenon,” which started taking place in earnest within the last three years, he added. “A lot of developers now see a value in having one of those big name architects designing their building,” el-Khoury told The Real Deal. Below, meet some of the architects from abroad who have recently entered Miami’s market. Piero Lissoni always wanted to work in metropolitan Miami. He just never had the chance until recently. According to the 60-year-old Italian architect, as recently as 10 years ago most private projects were restricted to South Florida-based architects. For the last 30 years, Lissoni and his Milan-based firm, Lissoni Associati, has designed hotels, apartments, offices, showrooms, houses and even yachts all over the globe. 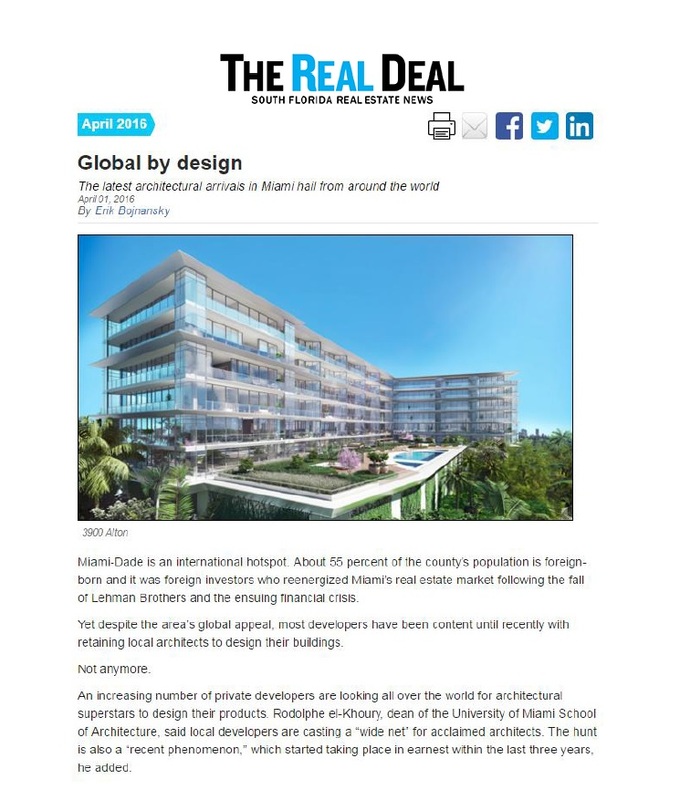 Lissoni’s entry into South Florida’s real estate market was via Lionheart Capital. In 2012, the Miami-based real estate development firm hired him to design the Ritz-Carlton Residences Miami Beach by Surprise Lake. His task: help convert the former Miami Heart Institute into a 111-unit luxury condo complex. It was a long process, one that is scheduled to finally end in late 2016. The challenging job earned Lissoni several admirers and, more importantly, additional assignments. Among those jobs is the 28-story Oceana Bal Harbour and the 53-story ONE Paraiso in Miami’s Edgewater. Both projects are due for completion in 2017.